I could not find information on the artist, though her work certainly resembles the style of Panos Valsamakis. NATIVE AMERICAN CERAMIC TILE 'NORTHERN LIGHTS' BY JOANNE BIRD. Scene depicts horseback riders in the forest. Tile measures appx. 6" x 7 3/4". Attractive use of various colors. See photos for best description. 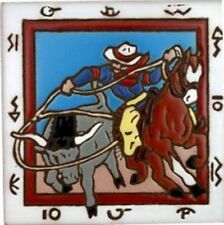 Downe Burns "Late For The Sky" Western Ceramic Tile 4.5" X 4.5"
Three mirrors are centered on the display. Made from natural plant fiber (bamboo fiber), 100% Recycled. 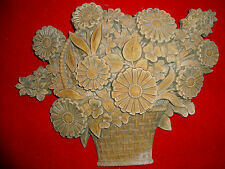 3D wall panels are ideal wall covering products that can be used in interior decoration. they are great solutions to ugly, stubborn problematic wall, ceiling or any surface that needs covering. 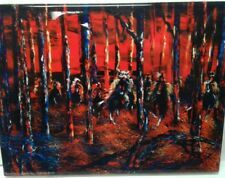 NATIVE AMERICAN CERAMIC TILE 'WOODLANDS' BY JOANNE BIRD. Riders on horseback in wooded scene. Tile measures appx. 6" x 7 3/4". The grooves are filled with their precisely corresponding shapes of coloured stone and secured in place with a white putty made from oil, and wax. The delicate process involves cutting and engraving marble shapes manually. SOUTH WEST Art tile Adobe house Desert Sky Scene signed ROBERT ARNOLD 8X8"
There are no other issues to be seen. It is a partial view of an Adobe house and the sky at dusk. We do not actually know the title of this beautiful work. Sold AS IS. This information is always disclosed in the condition section. Single ELLISON Tile - Greek Roman Goddess Face Relief Design - Perfect Condition. Made in St. Clair Shores, MI. 3.75" square and 0.75" thick. GREAT WAY TO START YOUR COLLECTION. Scene is horseback riders in blizzard conditions. Please scroll down to bottom of listing for complete description and to see all pictures. Pictures are considered part of description so please enlarge to see best detail, thank you Hello, for your consideration is an art pottery tile with ocean scene fish, shell and seahorse Details: Made of ceramic Raised detail Hand painted and glazed finish Measures 4" high X 12" wide Condition: Good color and condition ~ One under glaze chip, picture 5 and some small scattered missed glaze spots Thank you for looking, God Bless you and have a beautiful day!. The outline is a texture that looks like foam. 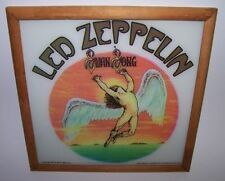 Looks like stained glass.The back ground is a pale yellow. 5 7/8" x 5 7/8" in size. They include: Chimayo (maker sticker on backside is missing); 1984 Teissedre; third tile has a worn label on backside - unsure of maker (backside is crooked as well); and finally a 1986 Teissedre. 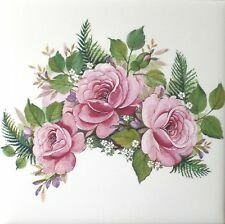 New ListingDESERT CACTUS PLANTS Art Tile Wall Hanging or Trivet by TEISSEDRE 6X6"
This pre owned art tile made by Teissedre Design Inc in the USA is in very good condition with no issues to be seen. It features a desert plant design of various cacti against a blue sky. The colourful glaze is shiny and intact. Historical Corner motif Oxen design in Delft Style color Blue. These tiles are straight and flat consistent in size. A collectible set of four Icelandic ceramic porcelain tiles. They are reproductions from the series “Old Drawings from Iceland” held at The National Library of Iceland. Each tile measures 6 inches by 6 inches. No cracks, in excellent condition. Some of the paper backups show some fading, discoloration. Imperfections may be found on the tile color and surface. 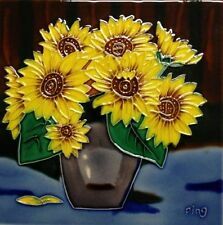 This was from Key West Art Tiles, Inc. Beautiful artwork! 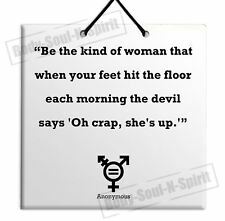 They include: 1983 Teissedre 7 7/8" x 7 7/8" (overall size of 9 1/8" x 9 1/8"); a Mag Mor Tile w/Wedding Vase Design - 7 7/8" x 7 7/8"; and a Triton Tile - 5 7/8" x 5 7/8" (overall size of approx. 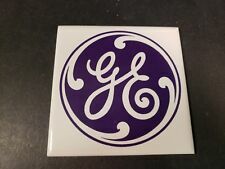 7 1/2" x 7 1/2"). 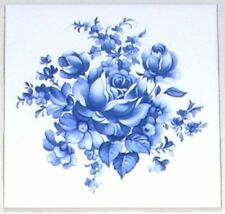 Historical Corner motif design in Delft Style color Blue. These tiles are straight and flat consistent in size. 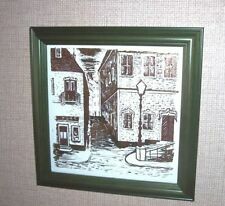 Here we have a beautiful KRIT signed 6x6 ceramic art tile trivet from Earthtones. We have other beautiful KRIT signed art tiles available. Browse through our site, there may be that one item your looking for. 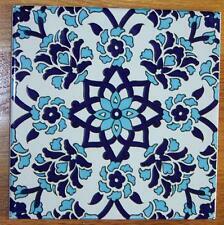 Use our Tile Art to create a focal point in your decor projects. Use them to embellish your Kitchen´s backsplash, to add drama to your Fireplace, to add style to your master Bathroom or to add character to your Foyer. Art Nouveau Ceramic Tile Mural William Morris Reproduction. the mural is made using the process of sublimation ,is waterproof . Mural made handmade by craftsman professional. Beautiful Ceramic TileMural William Morris Illustration, Reproduction. Breathtakingly beautiful. Must see in person. The colors and texture is amazing. In back it's stamped 11/28/73. On one top corner: I don't think it's a chip, more a scrape. Art Nouveau Alphonse Mucha Illustration Tile Ceramic Coasters (Set of 4) 4.25"
The images is printed directly on the tile. Cork full on the back to protect the table. clean them with a soft cloth . 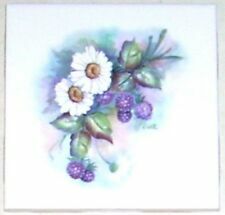 Vintage Kohler Reveries Prairie Flowers of the Midwest 14203-WF- 96 Tiles 2"X 6"